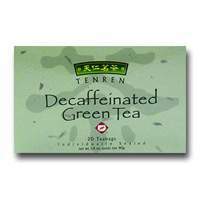 TenRen's Decaffeinated Green Tea Bags have been decaffeinated using the water method. This tea retains much of the flavor and aroma of green tea without the caffeine. Available in boxes of 20 tea bags.